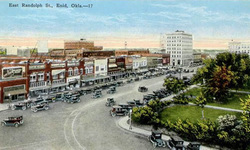 Like many of the towns and cities that arose in what became the state of Oklahoma, Enid has its origins in the 1893 land run on the Cherokee Outlet. Enid—a city 70 miles north of Oklahoma City and 42 miles south of the border with Kansas—was opened for settlement on September 16, 1893. The Rock Island Railroad had a station in Enid, and was set to bring in pioneers for the run, but an enterprising group of Cherokee made settlement a little more difficult than the government had planned. Realizing they could make a profit off the land run, the Cherokee claimed plots in what would become Enid, hoping to sell them later on; unwilling to give in to the Cherokees’ scheme, the local government moved the town site three miles south, and it was there that the government land office, post office, and courthouse were established. The train still stopped in the original Enid, bypassing the area marked for settlement. These two Enids were confusing, and the Jewish community in Enid began with this confusion. The story of the Jews of Enid begins with a flying leap and a broken ankle. Cousins Meyer Meibergen and Marinus Godschalk learned how to run a retail business in Cawker City, Kansas, from Meibergen’s father. With a few years’ experience under their belts, they decided it was time to open their own store. Traveling to Enid by freight train, the pair intended to open their clothing store on a plot they would claim in the land run on the Cherokee Outlet in 1893. When they passed through the new Enid, where they planned to open the business, the Rock Island Railroad didn’t stop. Taking his chances, Meibergen leapt from the train and broke his ankle. Godschalk, more risk-averse, stayed on the train for another three miles until it stopped in the original Enid. Then Godschalk, an immigrant from Holland, walked three miles south, put his cousin on a train back to Kansas so his ankle could heal, and set about finding a good place in Enid to open their store. Shortly after opening Meibergen & Godschalk on the west side of the intersection of Independence and Main, the pair realized they had made a mistake—all the other stores were opening on the east side of the square, so they picked up and moved a block away. Their men’s clothing store was the first in Enid, and it remained a local institution until 1944, when it closed with the Godschalk family as its sole proprietor. Within the first 20 years of settlement in Enid, the city had a Jewish mayor, numerous Jewish-owned stores, and a congregation called Temple Emanuel. Joseph Meibergen won the mayoral election in 1897 and despite the 1899 election being “one of the hottest contested elections ever held in Enid,” according to the Wichita Daily Eagle, Meibergen served as mayor for another two years. Enid Jews were close observers of politics, and were not afraid to fight for their interests as Jews. When early drafts of Oklahoma’s state constitution referred to Jesus in its preamble and body, a group of “Hebrew citizens of Enid,” according to the court documents, successfully petitioned the constitutional convention to eliminate the references. Photo courtesy of Oklahoma City Jewish Federation. Like Meibergen and Godschalk, the other Jews who came to Enid in the early years followed suit with the common trends of Jews around the country—they opened stores. Most of the businesses owned by Enid Jews were clothing stores and department stores, with only a few exceptions. Around 1899, Abe Herzberg came to Enid from Germany and opened a dry goods store. He quickly expanded to Herzberg’s Department Store, which he owned with Samuel Renberg. The store remained in business under different owners until it finally closed in 1980. Likewise, Max Hirsch and his brother Albert opened Hirsch Bros. clothing store in 1902, and were joined by their youngest brother Morris seven years later. The three brothers closed the store in 1919. Herbert Kaufman and his brother arrived in Enid in 1904, and together they opened a dry goods store on the west side of the city’s central square. The Kaufman’s store remained in business until it closed in 1940. Brothers Leopold and Julius Meis ran another clothing store, as did Harry Woolf. 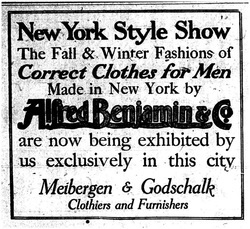 By 1909, Robert Aronberg had sold half of the ownership of Model Clothing, “leaders for fashionable clothing” to Edmund Klein. By the city’s 20th anniversary in 1913, eight of Enid’s clothing stores and two of its department stores were owned by Jewish families. Among the exceptions to the clothing department stores were a furniture store owned by Charles Lowenstein, a tailor shop, and a hotel. In 1913, Frank Locke was a tailor in Enid; he later moved to Ponca City with his wife Anna, where they were both active in the Jewish community. Albert Loewen was the only Jewish member of the planning committee that formed to bring a university to Enid, which resulted in the establishment of Phillips University in 1906. The next year, Loewen opened the fancy Loewen Hotel, which included a theater with nearly 1400 seats. Within five years, Loewen had sold the hotel. Randolph Street, where many Enid Jews had their stores. In 1908, a survey of Jewish life in small American cities documented around 25 Jews in Enid, enough to develop a formal community. Though it never had its own building, the Jewish congregation of Enid, Temple Emanuel, began to form around 1909. Throughout its less than 20 year existence, Temple Emanuel used various buildings for its services and Sunday school classes. The congregation was Reform, joined the Union of American Hebrew Congregations by 1910. That year, Isadore Gratz served as secretary of the congregation while Joseph Blatt, of Temple Emanuel in Oklahoma City, served as visiting rabbi. The congregation also had a religious school, which met at the Loewen Hotel. In May, 1911, Temple Emanuel received its official state charter, with the following men as its trustees: Robert Aronberg, Marinus Godschalk, Albert Hirsch, Herbert Kaufman, Charles Lowenstein, and Harry B. Woolf. Half of these founding trustees were native born, while the other three were immigrants. While they ranged in ages from 28 to 52 years, all of the six founding trustees were retail merchants, with most owning clothing stores. During its first year, Temple Emanuel held Rosh Hashanah services at the Seventh Day Adventist Church in Enid. Approximately 50 people attended services, which were led by a student rabbi from Hebrew Union College in Cincinnati. For much of the first ten years of the congregation’s existence, it met at the Loewen Hotel. Rabbi Blatt of Oklahoma City made occasional visits to the community, just as he did for small Jewish communities throughout the state. In 1915, Temple Emanuel had 15 member families, the most in its recorded history. That year, the community held Rosh Hashanah services at the Masonic Temple. On the day before Rosh Hashanah, the Enid Daily Eagle published a piece about the holiday in which it noted: “In towns like Enid, where there is no synagogue, on such special occasions as are being observed now, a student from one of the Jewish institutions of learning is sent to preach and to pray with the people.” Fittingly, the community had hired Raphael Goldenstein, a student rabbi from HUC-Cincinnati, to lead services and give the High Holiday sermons. Although the congregation was Reform, it celebrated Rosh Hashanah over two days, possibly to placate more traditional members. On the second day of services, Rabbi Goldenstein gave a sermon entitled “What is Reformed Judaism?” The next year, too, High Holiday services were held in the Masonic Hall and led by a student rabbi from HUC-Cincinnati. The service, as reported by the newspaper, also featured two female singers and a violinist, further evidence of the Reform nature of the congregation. During the late 1910s, the congregation, which still did not have its own permanent building, began to weaken. By 1919, Harry Woolf was president of the congregation, which numbered 12 member families, while Julius Meis was secretary. Only 50 Jews lived in Enid at the time. Temple Emanuel held services only on holidays and no longer had a Sunday school by 1919. Five years later, the Jewish community in Enid founded a B’nai B’rith chapter that had 20 members. Temple Emanuel had 12 members in 1925, but disbanded by 1930. Even without an active congregation, the Jewish community did not disappear. In 1937, 45 Jews still lived in Enid. 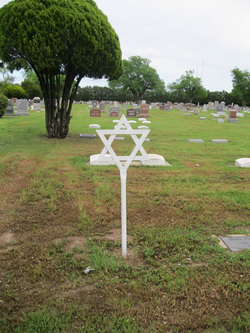 The Jewish community also maintained its own section in the Enid Cemetery, and Jewish community members continued to be buried there into the early 2000s. According to a history of Oklahoma Jewry compiled by Rabbi Joseph Levenson of Oklahoma City, three-quarters of Enid’s Jews were intermarried by 1925, only 15 years after the establishment of a congregation. This fact provides a possible explanation for the imminent demise of Temple Emanuel. The lack of a Jewish religious organization in Enid made it difficult for Jewish families to continue observing rituals in the same way they had been, leading them to travel to larger cities. In 1942, Benjamin Dritch spent the summer in Tulsa preparing for his bar mitzvah. Even as Jewish institutional life died out in Enid, some Jews remained committed to passing on their traditions to the next generation. For the seven years leading up to his bar mitzvah in 1963, Philip Kopp’s parents drove him 196 miles round trip between Enid and Emanuel Synagogue in Oklahoma City each week so he could attend Shabbat services. Among the gifts he received was an envelope with rare Israeli stamps autographed by his cousin, Yitzchak ben Zvi, President of Israel. Jewish families were active in aid efforts during the war years. The Enid Army Flying School was built in 1942, and drew in aviation cadets, some of whom were Jewish, to become aircraft pilots and officers. It also brought in ranking officers like Arnold Cohn and his family, who worked in the medical corps on the base. About 15 Jewish Enid men served in the military during World War II. Albert Buchheimer, vice president of Enid’s B’nai B’rith, was named to the board of the Enid USO. Albert’s wife Josephine was the president of the Enid chapter of the National Council of Jewish Women, and under her leadership the women’s organization made donations to the hospital at the air base. The B’nai B’rith lodge organized fundraisers for American Jewish Charities and also provided hospitality for Jewish servicemen stationed at the air base. The NCJW chapter disbanded by 1947, though the B’nai B’rith chapter remained active until at least 1955. Although Enid’s biggest industries in the pre-war years were oil and grain, most Jewish families were not directly involved with either business, concentrating instead on retail trade, as was common across the country. In 1933, Enid was home to at least ten Jewish-owned businesses, mostly clothing and department stores. Harry Gerson ran a clothing store while his son ran another; Sam and Hannah Lowenthal also had a clothing store. During the 1940s, Bernard Mayer opened a shoe store in Enid. 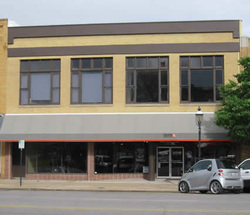 For the next 25 years, Mayer’s Shoes joined Herzberg’s Department Store and Harry Gerson’s The Fashion Shop as the only remaining Jewish-owned stores in Enid. In addition to the Herzberg and Kaufman families’ department stores, which had been opened for decades, Milton and Sol Newman moved from Joplin, Missouri, to Enid to open a branch of their family’s Newman Mercantile Co. It finally closed in 1987. Albert Buchheimer owned Rosenfield Jewelry Store from the mid-1920s until his retirement in 1947. Morris Singer opened a scrap metal business around 1924—his sons Herman, Charles, Richard, and Carl later joined the operation. The last Jewish-owned establishment in Enid closed 94 years after Meyer Meibergen jumped from the freight train that brought Jews to Enid for the first time. The community’s initial vitality couldn’t withstand the remarkably high intermarriage rate or the economic downturn that plagued the rest of Enid in the 1970s and 1980s. Those decades saw the closure of all remaining Jewish-owned businesses. In 1990, the city of Enid petitioned to have more than 275 houses placed on the National Register of Historic Places as part of the Waverly Historic District of Enid. Included in the district were the former homes of the Gerson, Herzberg, Kaufman, and Locke families. Thus, while the Jewish community may have disappeared, its legacy in Enid continues.